In the Summer my back deck is HOT. When you would like to sit out there on a lovely summer evening, the sun is beating down making it unbearable. So we put up a canopy. I had used this long ago when I did shows and events. It sort of worked but you see how the sun comes in at an angle? we built my ‘oh so handy’ potting bench out of them..
And now they become a shabbilicious garden room wall. 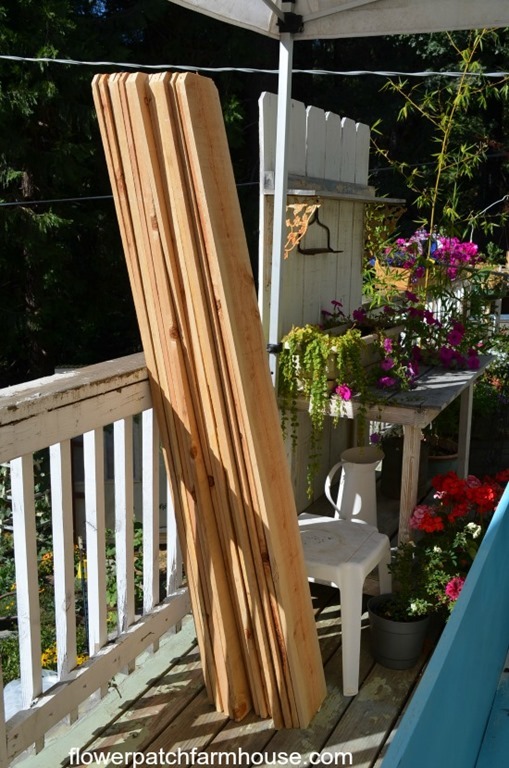 I had guesstimated it would take twenty 7.5 inch wide cedar fence boards to cover the space…. I knew I had hit pay dirt! he used what he called a ‘nibbler’. That nibbler worked like a charm, it cut thru that tin like a hot knife through butter but it sure was noisy! I have to finish painting the bench, you can see some white still on the one side…my paint ran out and I have been too buried in work to finish..
but this one surpassed my expectations. Now to build a sturdier shed roof over it so it can be used in winter…. but I was pleasantly surprised when he thought it a great idea.. Stayed tuned, it may be a good year before it happens but now that I planted that bug in his ear we will get a roof. Enjoy your day…still smoky here but I have yet to check the progress of the fires today. I wonder if they are getting a handle on it? Wow, it looks great! So glad your “helper” is looking forward to winterizing it for you. I’m visiting from the On Display Monday link party. Thank you, Marty, I am loving it more and more. How cute is this. I love the tin and wood together. That is tin panels isn’t it? Hope you get a roof-I have been waiting on a roof and a screened porch forever for my deck. I have a canopy too. 🙂 Yes that is old roofing tin. My dad was a roofer and he had piles of this stacked in the alley behind their house. I had seen a fence built with it at a fancy dancy restaurant and wanted one since. I won’t hold my breath on the roof but it is a nice thought. oh my gosh, love your new private space! I am loving it too, right now it is my painting booth. 🙂 I am painting that black round table. Love having the extra space to work!!! Not its intended use but it is working for me right now. What a fun way to create privacy. Love the garden room. I am finding that I love it even more than I had imagined. Now we are even more determined to somehow put roof on it somehow that will hold up to the snows we get. Love the way you took care of the Sun issue….especially at no cost! Great job! Shading the area on the cheap has made this space more user friendly, and we have been using the goodie out of it. As my hubby always asks? “Does it never end?” The work that is? I tell him. Not when you have a home. Besides it keeps us young. lol! Love the rustic tin panels between the fencing! Thanks for sharing with SYC. My husband asks the same thing. With me working away from home the past 6 months he is getting a full look at what it really entails to keep up a house as he is the one home now. 🙂 Huge education for him. Great use of the space and looks good too! It is still a work in progress but I do love it so.